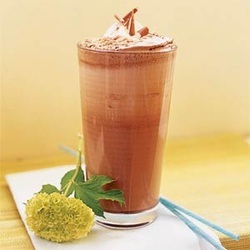 Meal Replacement Shake Snickers bar! Cheap, Easy and good for YOU! Combine all ingredients in a blender that crushes ice well. Mix to your desired consistency, adding more ice and water as needed. These cookies are just freak'n insane good! The best part is that they are actually somewhat healthy if you can stop at one or two cookies. 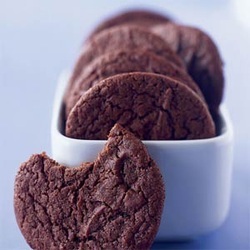 You can mix these incredibly easy, fudge cookies right in the saucepan. 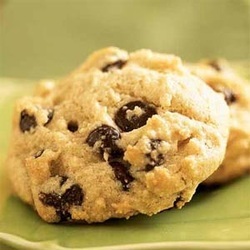 When freshly baked, these thin cookies have crisp edges and chewy centers. You can make them with either Dutch process or natural unsweetened cocoa powder; we opted for the latter but make them a few times and try out what option you like the best. Have fun experimenting because they will blow you away! Preparation Preheat oven to 350°. Lightly spoon flour into a dry measuring cup; level with a knife. Combine flour, soda, and salt; set aside. Melt butter in a large saucepan over medium heat. Remove from heat; stir in cocoa powder and sugars (mixture will resemble coarse sand). Add yogurt and vanilla, stirring to combine. Add flour mixture, stirring until moist. Drop by level tablespoons 2 inches apart onto baking sheets coated with cooking spray. Bake at 350° for 8 to 10 minutes or until almost set. Cool on pans 2 to 3 minutes or until firm. Remove cookies from pans; cool on wire racks. The charm here lies in the toppings, which guests can customize to their liking. Prep and Cook Time: 1 hour. Notes: No time to make tortilla strips? Store-bought chips will do in a pinch. Remember to choose only the best and freshest vegies for this recipe to get the most out of it and to get the best flavor out of it. Preparation 1. Heat 1 tbsp. vegetable oil in a large pot (at least 5 qts.) over medium heat. Add onions and cook until translucent, 5 to 7 minutes. Stir in two-thirds of the garlic, 1 tbsp. salt, cumin, and chile flakes and cook 2 minutes. 2. Add broth, tomatoes, and half the lime juice and increase heat to a gentle simmer; cook 20 minutes. 3. Meanwhile, pour about 1 in. of vegetable oil into a small frying pan set over medium-high heat. When oil is hot but not smoking, add one-third of the tortilla strips and cook until golden brown and crisp, about 2 minutes. With a slotted spoon, transfer strips to a paper towel-lined baking pan. Repeat with remaining tortilla strips in two batches. Sprinkle with 1 tsp. salt. Set aside. 4. Purée soup in batches in a blender. Return soup to pot and resume simmering. 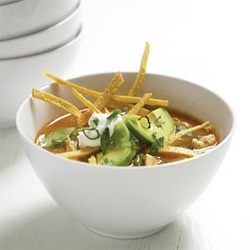 In a small bowl, toss chicken with remaining lime juice, garlic, and 1/2 tsp. salt. Marinate at room temperature for 10 minutes, then add to soup and simmer 5 minutes, until chicken is just cooked through. Stir in cilantro.. Preparation Combine oil and syrup in a large bowl; stir with a whisk. Add sugars; stir with a whisk until well blended. Stir in vanilla and egg whites. Lightly spoon flours into dry measuring cups; level with a knife. Combine flours, baking soda, and salt; stir with a whisk. Add flour mixture to sugar mixture, stirring until well combined. Stir in chips; cover and chill 1 hour. Drop dough by level tablespoons 2 inches apart onto baking sheets coated with cooking spray. Bake at 375° for 8 minutes or until almost set. Cool on pan 2 minutes or until firm. Remove from pan; cool on wire racks. Start by looking for grain-sweetened chocolate chips in health-food stores. Don't overeat these, I know first-hand how good they are so you will be tempted to eat just-one-more over and over. Don't fall for that trap. Eat you designated allotment, get your sweets fix and put them away! Holiday Good Banana Pumpkin Bread Recipe! Place mashed banana, pumpkin puree, oil, egg and egg whites in a large bowl. Beat with an electronic mixer on low speed. Place flour, sugar, baking powder, baking soda, salt, nutmeg, ginger and cinnamon in a medium bowl and stir with a whisk. Add flour mixture to banana and pumpkin mixture and beat until just moist. Pour batter into loaf pan and bake for 1 hour or until toothpick placed in center comes out clean. Note: this info will be off because of the substitutions that were made. But my guess is they are not that different. But if you are concerned, just take a smaller piece!